Renowned author Salman Rushdie is Emory's 2015 commencement keynote speaker. Renowned author and human rights advocate Salman Rushdie, University Distinguished Professor at Emory, will deliver the keynote address at the university's 170th commencement ceremony Monday, May 11. He will receive an honorary doctor of letters degree. Widely regarded as one of the greatest writers of our time, Rushdie won critical acclaim for his second novel, "Midnight’s Children," and worldwide fame after the Ayatollah Khomeini of Iran called for his death following the publication of "The Satanic Verses" in 1988. During his appointment at Emory as a University Distinguished Professor in the College of Arts and Sciences, which concludes this spring, Rushdie has deeply engaged with students and the academic community through classroom teaching and lectures, faculty forums, public talks and literary events. In 2006, Rushdie was named Distinguished Writer in Residence in the Department of English at Emory and placed his archive at the university, which opened to the public in 2010. Rushdie has said that having his archive organized and housed at Emory’s Manuscript, Archives and Rare Book Library (MARBL) enabled him to write his 2012 memoir, "Joseph Anton: A Memoir," about his years during the fatwa. "Emory is fortunate to be increasingly recognized for its eminent creative writing program and its robust collection of the papers of distinguished literary artists, which in addition to Salman Rushdie include Seamus Heaney, Flannery O'Connor, Alice Walker and many others," says President James Wagner. 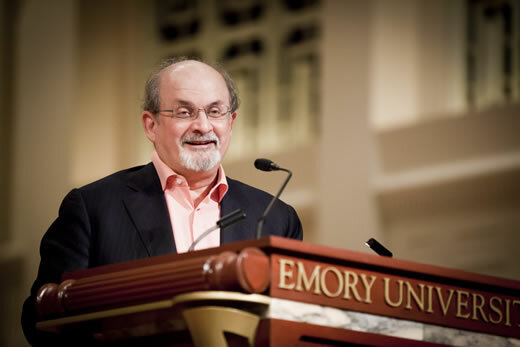 "Having Professor Rushdie deliver the keynote address at commencement as he concludes his visiting appointment on the faculty will be a significant celebration of this literary legacy at Emory as well as Sir Salman's own contributions to modern literature." The announcement of Rushdie's forthcoming commencement keynote address was made Sunday, Feb. 15, during Rushdie's public campus talk on human rights and "The Liberty Instinct." Shirley Franklin, former mayor of Atlanta and chair of the board of directors for the Center for Civil and Human Rights. Franklin will receive an honorary doctor of laws degree. Billy Frye, a nationally respected higher education administrator who served as Emory's first provost, chancellor, dean of what is now Laney Graduate School and interim president. Frye, an Emory alumnus, will receive an honorary doctor of letters degree. R. Randall Rollins, chairman of the board of directors for Rollins, Inc., renowned philanthropist and benefactor. Rollins will receive an honorary doctor of humane letters. For details on commencement weekend, see www.emory.edu/commencement.